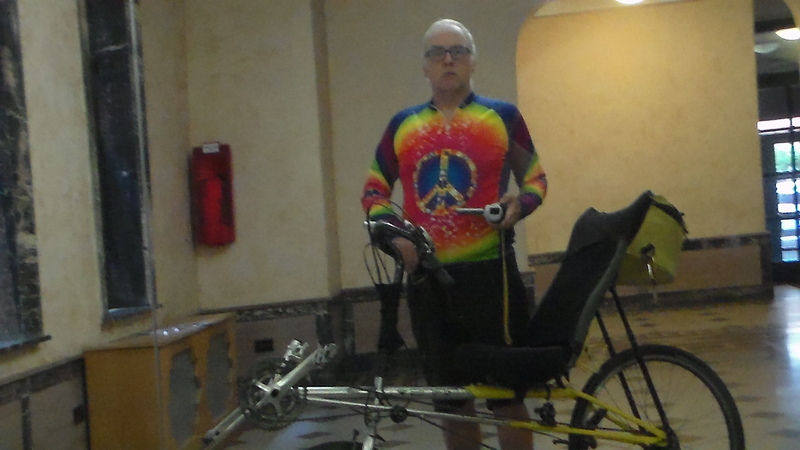 This is me in my semi-formal bike shirt standing with my (now )11,000 mile bike. Riding offers me shelter from the storm. This is (per WordPress math) my 400th blog posting. I started my blog in 2012 when the memes of Occupy Wall Street were not getting traction in Main Stream media. I also was working on touring a number of my plays–I was writing about protest and revolution and income inequality. Lots of gigs, very little money. I started my radio show not long after. There was change in the air, and I wanted to put a historical perspective to it (Old fogies of my ilk remember those historical cluster-f*cks like My Lai and the FBI’s hand in murdering Martin Luther King, Jr). Of late, I’ve been posting more and more about the phenomenon of Near Term Human Extinction (NTHE). My recent post about the expiration date for humanity (which was actually the day at which point we should hang up the whole human experiment because we’ll be in runaway warming) was among the most-clicked items I’ve ever posted. I am struggling with the idea that we may not have more than a few dozen months ahead of us. On a personal level, I’ve let things slide because, well, methane and 10c warming. I’ve pulled back from a bunch of cool posts I was working on. My piece on the NY transit grid having been broken is minus a few minor steps from posting. Ditto a long post about Hillary’s presidential run. I made some rather uncomfortable discoveries about my heritage, and I’ve been reflecting on those lately (it has a lot to do with the Confederate Flag). My day job involves inner city schools, and I’ve been ambivalent about writing about my experiences there. I’ve got a piece on ‘Obamacare’ (the ACA) that’s itching to be finished. You could be reading one of those right now. But no. You got this post instead. I’m pulling back for the moment. It isn’t because I don’t have anything to say. It’s because I’m tired of arguments and nastiness. A friend of mine in the NTHE movement is of the opinion that we all ‘know’ on some level that things are askew and about to get worse. Two hundred thousand plus years of hard-wiring set our brains for expectations about how the world should work, are no longer reliable and now we’re tripping circuit breakers all through our wet-ware as a result of global warming. We’re dealing with a powerlessness as best we all can, but some are grabbing onto ‘hopium’ and playing it for all it’s worth. I’ve gotten a few website trolls and I’ve tired of dealing with them. I also feel terribly out of step with my peers. I have a high school reunion coming up, and I have zero interest in attending after seeing first-hand the Facebook Points of View of many of the suburbanites who’ll be in attendance. In the meantime: I’ve finished a new play about NTHE. It’s a one-person show encompassing the work of people like Guy McPherson and Michael Ruppert and Michael Mann and others. I tried to lay out the case for the science, while also couching it in humor (it’s a CLOWN show, FFS). In putting it together over the last year, I’ve had to wrestle with existential questions about whether we Homo Sapiens, as the ‘big kahuna’ race on this planet, could have taken actions to avoid the current abyss. It’s the best danged thing I think I’ve written, and I’m not sure if anybody will produce it or if it will be relevant come October when the cat’s out of the bag on warming. But it’s here. If you have a venue, drop me a line in the comments. Join me in a week or so and we’ll all have better stories. ‘Kay? ← Are Climate Deniers Racketeers? or just Good Fellas?